[NEW YORK, NY] On Tuesday, Ecuadorean villagers from the Amazon rainforest region ravaged by Chevron’s oil contamination will join supporters for a large rally in Foley Square across from the courthouse where a trial will open in the California-based oil giant’s retaliatory R.I.C.O. (Racketeer Influenced & Corrupt Organization Act) lawsuit against the Ecuadorians and their U.S.-based legal advocates. The Ecuadorians are representing 30,000 plaintiffs who won a landmark judgment against Chevron in an Ecuadorian court in 2011, wherein the company was ordered to pay more than $18 billion towards the cleanup of widespread contamination, as well as compensatory and punitive damages. The case, holding Chevron accountable for toxic dumping by its predecessor company, Texaco, has been upheld by appellate courts in Ecuador. Nearly 20 years since the case was filed in 1993, Chevron refuses to pay for a cleanup, and is waging a scorched-earth legal, PR, and lobbying campaign to crush its victims and their advocates and supporters. The oil giant stripped its assets from the country, forcing the Ecuadorians to pursue enforcement of the judgment in countries where the Chevron still maintains assets. Chevron’s use of the Racketeer Influenced and Corrupt Organization Act when filing suit against the Ecuadorian victims [.pdf ] and their advocates is the latest chapter in their attempts to evade accountability and repress those trying to hold the company to task. The Foley Square protest will feature villagers from the Ecuadorean Amazon living amidst hundreds of Chevron’s abandoned toxic waste pits that litter the region. They will be displaying bottles of water polluted by Chevron oil operations, as well as images of friends, family, and community members who have died or suffered cancer and similar illnesses from prolonged exposure to petroleum wastewater. The rally is being organized by members of New York’s Ecuadorean community, along with human rights supporters and environmental activists, who will be supporting them with a massive ‘Lady Justice’ figure and other visually arresting props. Forty-seven ‘named plaintiffs’—all of them indigenous rainforest residents and rural villagers—who represent the tens of thousands of affected people have been named in Chevron’s lawsuit, which alleges that their previous claim and subsequent judgement are a conspiracy to extort the company. Two of the Ecuadorean villagers have accepted personal jurisdiction in the case in order to fight the allegations. Fearing a public backlash for suing victims of its pollution, Chevron has focused its smear campaign on New York-based human rights attorney Steven Donziger, who has advised the Ecuadorians in their efforts since first visiting the contaminated region in 1993. 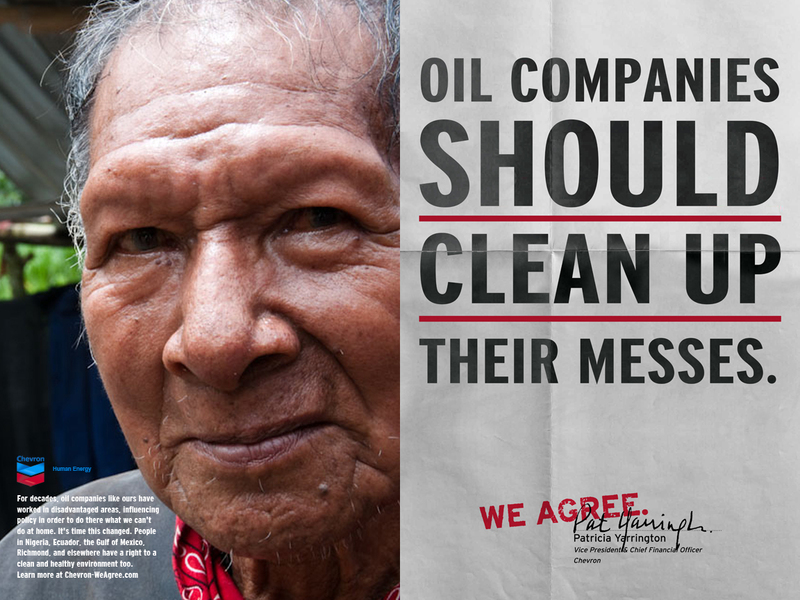 “I lost two children to Texaco’s pollution and the company now calls me a criminal for daring to demand justice,” said Emergildo Criollo, a leader of the Cofan indigenous tribe in whose ancestral lands the oil company first explored for oil in 1964. Texaco operated in Ecuador until 1992, and Chevron absorbed the company in 2001, assuming all of its predecessor’s assets and liabilities. “Since the company arrived, our culture has been decimated, our children poisoned, our rainforest ruined, and Chevron dares to call us criminals?” continued Criollo. The Ecuadorians and their supporters have called for an end to Chevron’s retaliatory lawsuit, and are calling this latest effort a “rigged show trial” before a federal judge, Lewis A. Kaplan, who has displayed outright hostility to the Ecuadorians’ legal efforts to demand a cleanup. Judge Kaplan has also made repeated disparaging comments, on the record, about Ecuador’s judicial system. Should Chevron win their case in front of Kaplan, an injunction would be put in place barring Steven Donziger from attempting to enforce the Ecuadorean judgment in a U.S. court and from collecting money from the judgement in any other venue. Chevron has admitted to dumping nearly 16 billion gallons of toxic wastewater—the byproduct of oil drilling and pumping—into rivers and streams relied upon by thousands of people for drinking, bathing, and subsistence. The company also abandoned hundreds of unlined, open waste pits filled with crude, sludge, and oil drilling chemicals throughout the inhabited rainforest region. In other countries at the same time as it was operating with no environmental controls in Ecuador, the company re-injected wastewater, and used easily-deployed technology to deal with toxic byproducts of its oil drilling. Multiple independent health studies have shown an epidemic of oil-related birth defects, cancers, and other illness. It is estimated that the contamination has directly led to at least 1,400 deaths in the region. Tagged Amazon, Chevron, Ecuador, Fraud, oil, Rain Forest, RICO, Steven Donziger, Texaco.